How Far is ESGBE KumaraGuru? 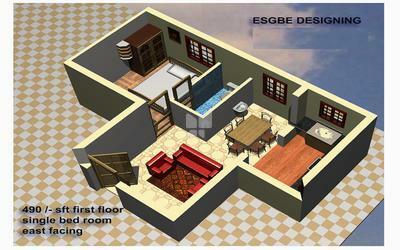 Kumaraguru is a residential ( Ready to Occupy) project by ESGBE designing builders Chennai. The project shines out with a load of amenities and is located in one of the main residential areas majorly connected to areas in and around the place. Ready to Occupy- All Completed Stage. a. Flat inside any alteration work for after completion extra charge will be applicable. b. Balcony & Service aria safety grill fixing. a. Structure – RCC column pillar with foundation as per structural engineering rules. RCC Roof slabs for as per structural engineering rules. Using for OPC branded company cement. Using for river sand, clay bricks & PPC branded cement. c. Common area -- Staircase – Riser – 6” & Thred- 10”. Using MS hand rail entire area. Sahapath slab or equal rate tiles laying. Car parking & passage – Cement floor finishing. Floor height 1’-6” from road level. Ground floor basement height – 3’-0” from the road level. All Flat clear ceiling height 9’-6” to 10’-0” from the floor level. Over head tank using brick wall 6,000 liter’s. PVC pipe line connection with pasted type. Brick wall Septic tank – 12,000 liters. a. Main door – Gana Teak wood frame size 3”X 5” with teak wood panel door. All accessories fitting are brass. Main door lock godraj or equality. b. Other doors – Country wood frame ( Konku) size 3” X 4”. with molded flush door. All accessories fitting are stainless steel hinges and handle with lock. c. Window -- Country wood frame ( Konku) size 3” X 4”. Fixed for 10mm grill with Enamel painting. Using for 4mm edging glass. d. French door with window -- Country wood frame ( Konku) size 3” X 5”. e. Toilet ventilator & door – Country wood frame ( Konku) size 3” X 4”. with pinhead class provision. d. Steps area --Sahapath slab or equal rate tiles laying. a. Hall & Dining 2 no’s decorative light point, 2 no’s Tube light point & 2no’s ceiling fan point. One side TV & Telephone point with 3 no’s 5 AMP pluck point provision. Switch box attached 1 no 5AMP pluck point provision. b. M.Bed & Bed 2 no’s Two way switch provision for tube light & Fan point. 2 no’s light point,1no AC Point & 1 no ceiling fan point. One side TV point with 2 no’s 5 AMP pluck point provision. c. Kitchen & Service2 no’s light point & 1 ceiling fan point. 3no’s 15 AMP point for grinder, electric oven & washing machine. d . Balcony 1 light point, Switch box attached 1 no 5AMP pluck point provision. e . Toilet 1 light point, 1 no 15AMP pluck for geyser & 1 no 5 AMP pluck for exhaust. a. Kitchen & Service Diamond single bowel sink with 1 no swag neck tap provision. 1 no tap provision for aqua cord. b. Common Toilet 2 in 1 wall mixer tap provision. IWC with washing tap provision. Wash basin with tap provision. c. Attached Toilet 2 in 1 wall mixer tap provision. EWC with health fast tap provision. d. Washing machine Service or any one side tap provision. platform in 2’0” wide X 10’-0” Lenth with attached gas hose provision. d . Toilet 2 No’s corner kadappa slabs provision. Apply for birla wall patty two coat and apply for base primer paint one coat. Top coverage apply light color for Asian brand -Tractor emulsion two coat. Top coverage apply white for Asian brand- Tractor emulsion two coat. Top coverage apply for Asian brand- ACE whether proof paint two coat.